I am 62 and enjoy good, robust health. I hope to serve at least a good 8 to 10+ years or more in ministry. I am originally from the Midwest, but have lived in Houston, Texas, for more than three decades before relocating for my ministerial internships in 2012 and 2013. I have been divorced for 16 years, and have no children, which allows me tremendous flexibility in responding to a church call in any number of locations throughout the U.S.
No biographical background would be complete without mentioning my unique and special bond with three pet turtles. We celebrated the divine Ms. Ellie Belly's 42nd birthday in 2013. She was the size of a quarter when I first got her, and now she’s a 4- to 5-pound chunky monkey about 10 inches or so long. I also have two males, Rex and P.D., who have been with me for about 25 years. 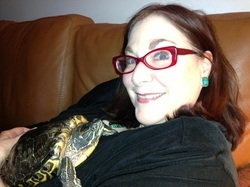 All three turtles certainly know who I am. They know their individual names and will sometimes come when they are called. However, like cats, they'll come on over only if they really want to do so. Each has his or her unique personality, and, as such, I have an individual relationship with each turtle. These little characters bring tremendous joy to my life. They are a source of endless surprise and wonder. Needless to say, my turtles were always a huge hit every year at the blessing of the animals service in my home congregation in Houston!